then ‘Dead Sea Games’ is the book for you! James Hazzard resides in Illinois with his family and is another author I’ve known for a few years. His writing has enthralled me, and I seriously did bite my nails whilst reading ‘Dead Sea Games’! He has a PhD in molecular biophysics that he now uses to figure out how to scientifically justify the existence of mythical creatures. My kind of guy, I mean dragons – they exist, of course they do! It’s my pleasure to interview him in my latest Author Feature. 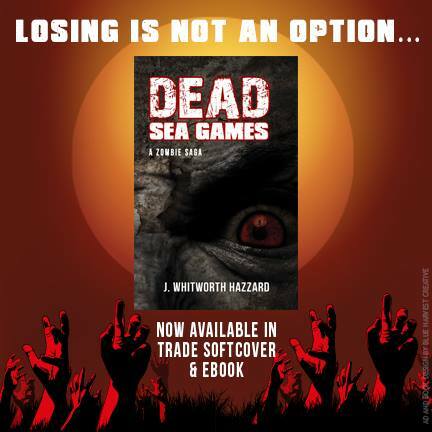 I love the totally original Dead Sea of the title, you’ll have to buy the book to know why, but, with a fair amount of zombie television, movies and books already out there, what made you want to compete and write within this genre of horror? The honest answer to this question is that I didn’t set out to write in this crowded space. I love the genre, but it’s a small niche in the overall horror space, and I was more interested in the action/adventure aspect of post-apocalyptic survival. Dead Sea Games started out as a flash fiction piece, and after I won the contest it was entered in, I couldn’t leave it alone. I kept coming back to the story and decided I had to know what happened to Jeremy. Thus the novel was born. You appear to have quite a scientific/mathematical background, from where did you draw your inspiration? So many years of biophysics, biochemistry, and biomechanics gives you a lot of time on your hands to think about mythical creatures. My very first attempt at a novel used a similar scientific approach to justify how a dragon could survive into the modern world. After I read World War Z, I came up with pages and pages of theories on how a “zombie” could evolve and survive realistically. There is a huge (and unsolvable) energy transport problem that I solved using…well, now I wouldn’t want to spoil it for you. You’ll find out how I solved the problem in the sequel Dead Sea Escape in 2016. Your characters are diverse, strong, vulnerable and fully-rounded, and I willed them on right from the start. How much of yourself did you place in Deathwish, or was he drawn completely from your imagination? Deathwish is an extremely wilful and difficult child that’s been forced to grow up extremely fast. He’s modelled after my own kids (sorry!) with a little more sass and bravado thrown into the mix. There’s a lot of me in Jeremy’s view on life and his situation, except for that part where he yells at his mother…which I would never, never do. I can really see Dead Sea Games on television or on the big screen; if it made it do you have any preferences for actors or actresses and what sort of soundtrack would you go for? It’s funny you mention the sound track, because from the very beginning I put together a “DSG Playlist” and would fire it up every time I sat down to write. Some of the lyrics and songs even made it into the book in various forms. If Jeremy ever makes it to the big screen, I’d like an unknown to get the role. I haven’t seen a teen actor lately that have the kind of physicality and screen presence Deathwish needs, and they grow up so fast anyone I picked today would be in their thirties by the time it was made. All the rest of the cast I have pretty clearly in my head as mainstream actors. All I want in life is to have Jason Statham cast as the Khan. Come on, Jason! Writing, for me, is one of those compulsions that builds up over time, and if I don’t write something it starts to drive me nuts. I love writing but it’s difficult to keep up a steady pace, because once I finish a project I can feel empty for weeks. I’m slowly closing in on that 1,000,000 word mark, but I still feel like a novice. For me, that feeling like I have so much more to learn is what keeps me coming back to the process and reaching out to other writers. So, see if you can survive the Dead Sea Games… I’m not a horror reader in general, but I love The Walking Dead, and this book had me gripped! This is the best book I’ve read in the zombie genre, and with a few other unread zombie books now residing within my kindle, this is the standard they need to reach. Now I’m so excited for Dead Sea Escape! 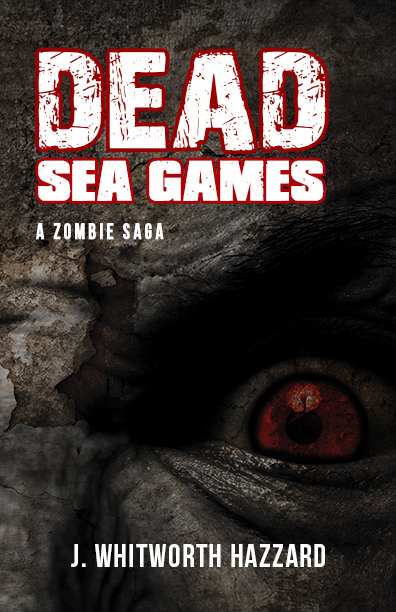 Dead Sea Games is available on Amazon US and UK and your local Amazon store in both eBook and paperback. Find out more on his Amazon Author Page. Like myself, James Hazzard works with Blue Harvest Creative, our Publishing Partner. You can find him on Facebook , Twitter, Goodreads and Google+. Or feel free to stop by his blog for flash fiction and book reviews at Zombie Mechanics. 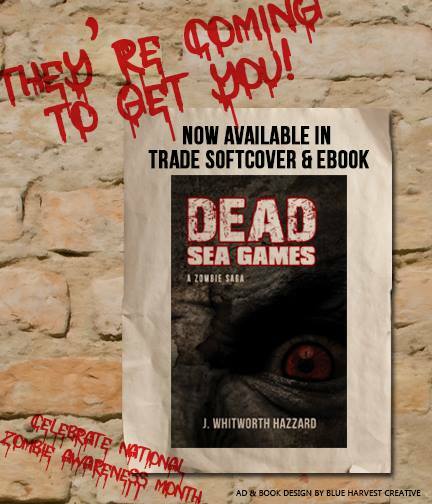 This entry was posted in Author Interviews, Books, Interviews, Writing and tagged author feature, Dead Sea Games, fiction, inteview, J. Whitworth Hazzard, James Hazzard, survival, Zombie Mechanics, zombies on 26th June 2015 by Lisa Shambrook.